Missouri – Where is Ruthi? 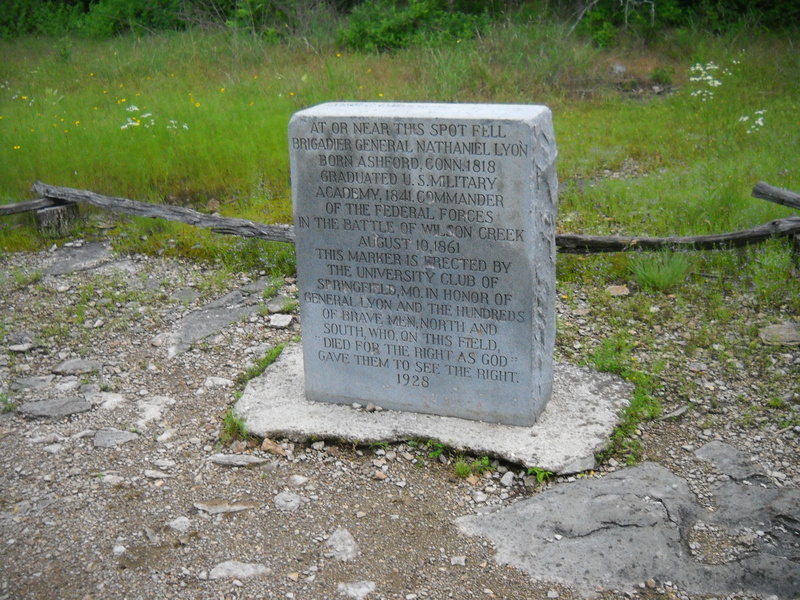 Wilson’s Creek National Battlefield, near Springfield, Missouri, was the location of the second battle of the Civil War. And, as it turns out, the location for yet another battle with my poor sense of direction. Spoiler alert: the Battlefield won. 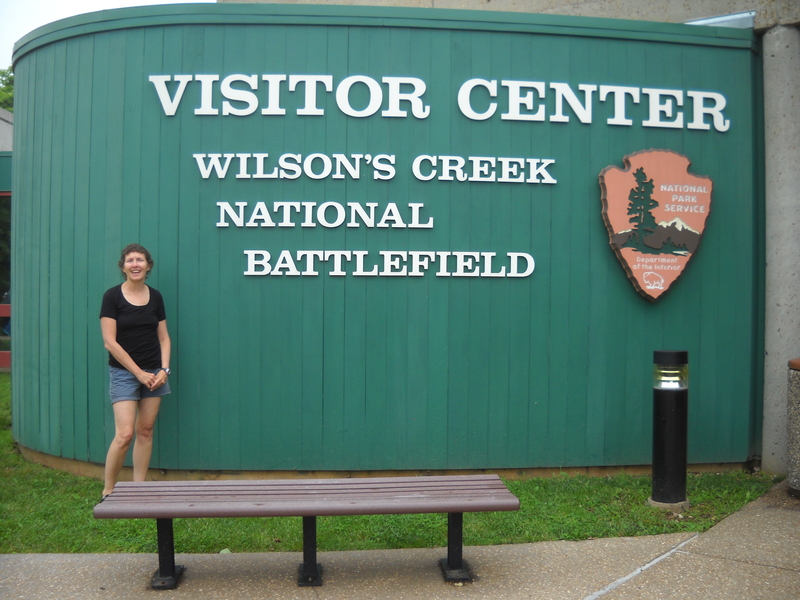 After visiting the Visitor Center, watching the 30-minute film explaining the Battle of Wilson’s Creek, viewing the eight-minute light-up map exhibit describing the maneuvers of both the Union and Confederate armies, obtaining my National Passport Cancellation stamps, taking the required restroom break, changing from shorts to hiking pants, changing from sandals to hiking shoes, spraying bug repellent, and taking another restroom break, I’m prepared for the 5-mile, 8-stop auto tour route of the actual battlefield. Stop One goes well. I hike half a mile on a well-marked trail to view the site of what was once Gibson’s Mill. I carry my Osprey day-pack with a full water bladder, the “Ten Essentials”, a few Lara bars, a camera, binoculars, a rain jacket, and rain pants. Some people may think this is overkill for an easy half-mile hike; but those who know me well probably think I don’t carry enough. I have a tendency to get lost. Half a mile can easily turn into three, four, ten miles. Stop Two is even better. I am lucky to be visiting Wilson’s Creek National Battlefield on a popular school field trip day in the middle of the week in the beginning of June and a volunteer interpretive guide is giving informative tours of the Ray House. John Ray and his family lived here during the Battle of Wilson’s Creek. 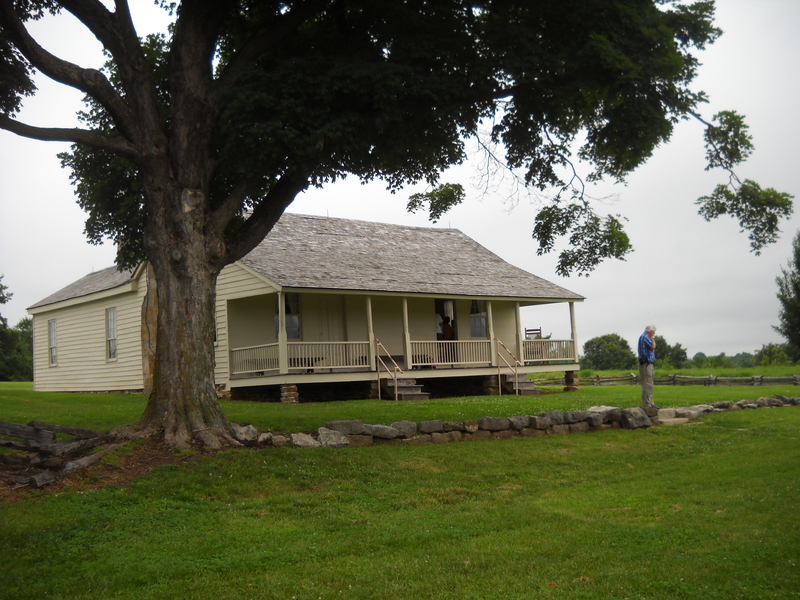 While the battle raged in his cornfield, John Ray watched from this very porch (this is the original house with its original furnishings) while his wife and five of their children, his slave Aunt Rhoda and her four children, took refuge in the root cellar. After the battle, the house was turned into a field hospital and Union General Nathaniel Lyon’s body was brought here to await transport to his home for burial. Stop Three involves three short hikes to various sites. If I turn right, I walk an easy 1/4-mile to a Confederate Battery Site. No problem. I take a quick pic and return to the starting point. To the left 1/4 mile leads to a recreated log home that indicates the site of Edwards Cabin, the headquarters of Confederate Major General Sterling Price. As I approach the cabin, I notice a sign pointing in the direction of Bloody Hill. I look at my map at see Bloody Hill is Stop Seven of the 5-mile loop auto route so, after taking a pic of Edwards Cabin, I return to the trailhead parking area. Across the street from the parking area is a wooden staircase leading to an overlook of the East Battlefield. I think “why not?”, I am prepared for anything so I climb the stairs, walk the path to the overlook, look out of the overlook, walk the path back to the stairs, descend the stairs, and return to my car. Stops Four, Five, and Six involve reading the placards explaining what occurred at each site. 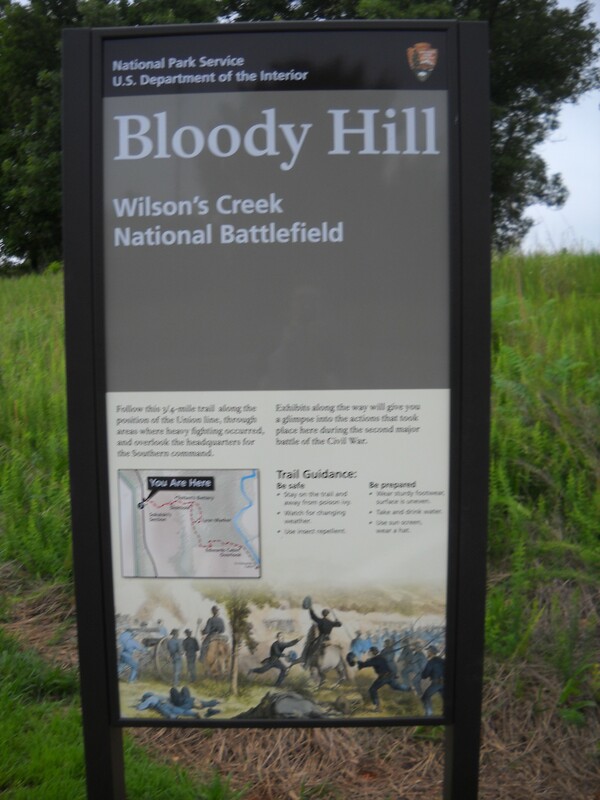 Bloody Hill is the main focus of the Battle at Wilson’s Creek and it is Stop Seven. Early in the morning of August 10, 1861, Union General Nathaniel Lyon and his army of 4,200 soldiers attacked the sleeping Confederates. At the same time, Colonel Franz Sigel and another 1,200 men were to strike the Confederates right flank. Sigel became confused when he mistook approaching soldiers for a Union regiment when in reality they were Confederate. After a skirmish, Sigel retreated to Springfield, Missouri. Lyon was unaware of the defeat when he charged Confederate General Benjamin McCulloch’s army and a five-hour battle on Bloody Hill ensued. General Lyon was killed as he led a countercharge making him the first general killed in the Civil War. With Lyon’s death and Sigel’s failed flanking maneuver, the Confederate army took Wilson’s Creek. As I arrive at Stop Seven, I notice the sky beginning to darken as heavy rain clouds outnumber the fluffy white ones. I glance at my map and determine I can complete the 3/4 mile loop trail much faster without carrying my pack. I grab the car keys and the camera and proceed to the placard explaining the battle. I approach the fork in the trail which the map indicates is a loop and choose the left path. I pass the site of Totten’s Battery. I proceed around the loop and find the stone that marks where Lyon fell to his death. As I’m reading the sign, the heavens open. And not gentle, fat, rain droplets. Buckets and buckets of wet rain pour from the sky. And my rain jacket is in my day pack. And my day pack is in my car. All day I have carried that pack. I even wore it during the tour of Ray’s House. Oh well, at least it is not a cold rain. I duck my head and hurry down the trail. As I walk, I notice I am going down hill. Shouldn’t I be traveling up hill? Bloody Hill is on a HILL! And I started at the top of the hill. Yes, I’m positive, I came down the hill so I should be going up a hill. Bloody H!@! on Bloody Hill! I have done it again. I got turned around and now I am lost. Up ahead I notice a small cabin. It’s Edward’s Cabin! I have cut straight through the woods and am back at Stop Three. Should I turn around and walk the MILE I just trekked? Or hike another 1/4 mile and take a chance there is a car in the parking area that can give me a ride? I am soaked to the skin, my socks are squishy, and my underwear will have to be wrung out so what’s another 1/2 mile if no one is there? At least I know where I am and am no longer lost. I quickly make my decision. As I clear the trees, I notice a car in the parking area. In the pouring rain, with my black IceBreaker T-shirt clinging to my body, my brown hair plastered to my head, my tan hiking pants discolored to a water-stained chocolate brown, I knock on the window of a red minivan. Thinking the storm has caused the ghosts of fallen Civil War soldiers to rise from their last resting spot to tap out a cry for help on her passenger window, the poor woman I’m peering at jumps out of her skin. She quickly recovers and puts on a brave facade as she cautiously and suspiciously cracks the window. In my most pitiful voice, I ask for a ride. The back door of the minivan slides open in a welcoming gesture and I am embraced in a warm, dry blanket. Although I have just given her and her retired history teacher husband the fright of their lives, this lovely, kind couple act like every day a soaking wet, middle-aged stranger gets in their car during a torrential downpour on a deserted battlefield. We make introductions, I explain that I was caught in the rain (leaving out the part where I get lost… I do have some dignity), and tell them my vehicle is at Stop Seven.